This interim version uses a manual installation procedure. Once the EPOS application is released in the Windows Store, the procedure will become simpler and this procedure will be updated. The Booking Live EPOS application runs only on Windows 10. The Windows 10 app architecture incorporates a security layer that prevents the installation of malicious apps. This allows you to download apps from the Windows Store with confidence. However, since interim releases of the application are distributed directly (not via the Windows Store) you must explicitly authorize your computer to install them. Interim releases are distributed via WeTransfer. Use the link provided in the WeTransfer email that you received to download the ZIP file containing the app and unzip it in a convenient location. Right-click on the Add-AppDevPackage.ps1 file and select Run with PowerShell. You may be prompted to confirm that you trust this application (execution policy). Caution: depending on the configuration of your computer, the .ps1 file extension may be hidden and the Add-AppDevPackage file may appear like a standard text document (Notepad file). When the installation is complete (which takes about 20 seconds) you will receive a confirmation and you may close the PowerShell window. Start by connecting your POS printer to your Windows computer, using a USB cable, and then connecting the cash drawer to the printer using its integral control cable. The EPOS application relies on a foundation library, which must be installed before you first run it for the first time. Download the Microsoft POS for .NET installer and follow the installation instructions. Before installing and running the EPOS application, you need to install the OPOS drivers for your POS receipt printer. For Star Micronics devices, the installation of OPOS drivers is documented here. The OPOS driver installation process entails assigning a Logical Device Name (LDN) to your attached receipt printer. We recommend using a name such as ReceiptPrinter, but the choice of name is not important, since the EPOS application identifies devices by their device type; not by their name. Before attempting to run the EPOS application, you should verify that the connected printer and cash drawer are functioning correctly. You can do this by running the Health Check operation described on page 5 of the OPOS driver installation instructions. Launch the application from Windows Search, using the name Booking Live EPOS. Enter the URL prefix that uniquely identifies your subdomain within the Booking Live platform. When you enter a value and move to another input field, the initialisation mechanism will immediately validate it and display either a green check mark (tick) or a red cross mark, to indicate whether it is a valid Booking Live client identifier. Enter the secret key that is configured within your Booking Live account. When you enter a value and move to another input field, the initialisation mechanism will immediately validate it and display either a green check mark (tick) or a red cross mark, to indicate whether it has been able to successfully connect to and access your Booking Live account. Note that the EPOS application only supports the SHA256 hashing method, so this method must also be selected as the active hashing method within your Booking Live account. 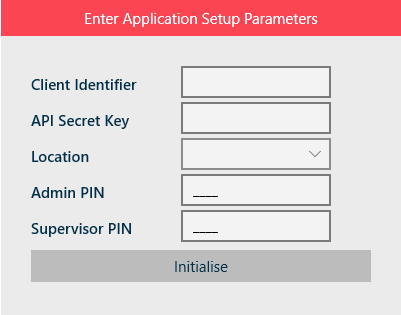 Having entered a valid Client Identifier, the initialisation mechanism will automatically populate the locations list with the locations defined within your Booking Live account. Simply open the drop-down list and choose the location that corresponds to the deployment location for your EPOS application. The admin PIN protects access to technical features of the application, preventing cashiers and other non-technical staff from making changes that might disrupt operation. Enter a 4-digit numeric PIN code that will be known only to the admin user. 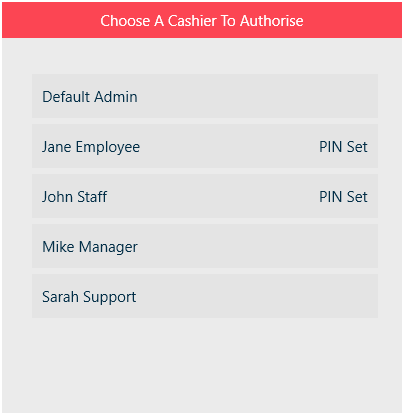 The supervisor PIN protects access to supervisory EPOS features, preventing cashiers and other unauthorised staff from viewing financial data or interfering with the critical operations of the EPOS application. The supervisor PIN code can also be used as a substitute for any cashier PIN code, enabling any cashier account to be opened (for example, when a cashier has unexpectedly left the premises without entering her closing cash float and closing her open EPOS session). Enter a 4-digit numeric PIN code that will be known only to the cash desk supervisor. Once you have entered valid values for all 5 setup parameters, the Initialise button will become enabled. Touch this button to launch the initialisation sequence and wait while it executes. This usually takes around 20 seconds. 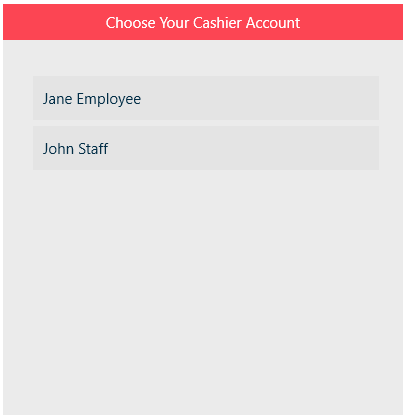 However, the first time you run the application (immediately after initialisation has been completed) the above screen will contain an empty list of cashiers, since you have yet to authorise any cashiers. Unless your EPOS system is configured to operate without cashier identification (explained under Customizing Your EPOS Configuration below) you should allocate a separate PIN code to each cashier and require your cashiers to sign in using this PIN code before entering EPOS sales. In order to use the EPOS application, your staff must first be defined as staff members within the Booking Live platform. If you add new staff members to the platform, you will need to close and reopen the EPOS application in order for it to recognise them. Staff members that are already authorised as cashiers are distinguishable by the PIN Set annotation adjacent to their name. Other staff members are not able to open an EPOS session until you authorise them by allocating a PIN code to them. Each cashier PIN code must comprise of 4 numeric digits. These may be entered using either the computer keyboard or by touching the buttons on the on-screen keypad. Only numeric digits are recognised. As soon as 4 digits have been entered, the check mark (tick) button becomes enabled and the cashier may touch it to confirm her choice of PIN. The cross mark button may be used to erase a partially-complete entry and start again. When a PIN code has been assigned to the cashier, the EPOS application will beep and the supervisor may use the Back button (in the top left corner of the application window) to return to the previous screen and continue authorising other cashiers. When authorisation is complete for all required cashiers, touch the Back button again to exit the Manage Cashiers feature.